Earlier this year, Remediation Strategies were asked to look into the development of a pneumatic barrier for a specific oil spill response scenario. 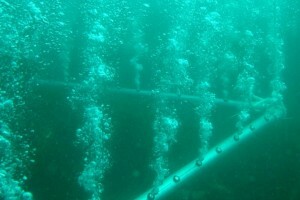 A pneumatic barrier uses compressed air in an underwater environment to create a vertical ‘bubble barrier’ and a standing wave at the water surface. The purpose of the barrier is to contain a given spillage of oil. After a detailed literature review, Remediation Strategies built a prototype test rig and mobilised a full set of equipment to a test site in West Wales. The test site was specially selected to replicate the conditions of the location where the final barrier was to be deployed. 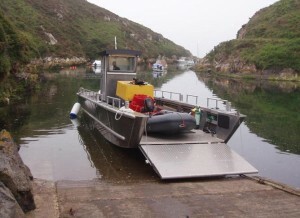 We utilised a landing craft built locally by Robust Boats as a working platform and loaded plant, equipment and personnel for a full one day trial. 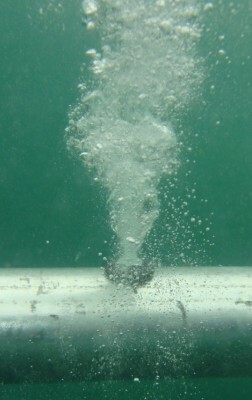 The test rig was designed to allow a number of variables to be adjusted during the test, such as air flow (pressure and volume), nozzle spacing and nozzle size. The rig was set up and operated at shallow depth to ensure the system was fully operable. Using an underwater camera, we were able to record a number of images of the pneumatic barrier in operation. Once fully checked, we tested the system at shallow depth using oranges which are reported to behave in a very similar manner to floating oil. They also have the added benefit of being easily visible. The oranges were deployed within the area of the test rig to ascertain whether the system, when operating, would effectively contain the oranges within the perimeter. Any oranges escaping would represent an oil escape and a failure of the test. We recorded a video of the first test conducted at shallow depth, please click the link to view. Following the initial test, we operated our system at the full depth required by our customer, with the image below recording the effect of depth on operation. The test achieved its objective, that is to prove the effectiveness of the concept, and we went on to present the findings of the trial to our customer and to prove the concept in-situ at his facility.